Snoring can be a serious problem, especially for the snorer’s sleeping partner. It can be difficult to know how to find a snoring aid that works. There is a bewildering variety of devices, but there will almost certainly be one that suits you. We have assembled some information to help you make the right choice. Snoring is common, especially as we grow older. However, even babies can snore. If you are over the age of 40, there is a 40% chance you know you snore. Your sleeping partner puts the figure at almost 60%. There is more than one cause of snoring. Some people snore because their nose is blocked, some because the airway at the back of the throat narrows as your muscles relax in sleep. When the airway is partially blocked, the passage of air causes the tissues to vibrate – and you (or your partner) hear the vibrations commonly known as snoring. The sound of snoring tends to be louder if you sleep on your back or with your mouth open. The physical way your body is constructed also affects your propensity for snoring. 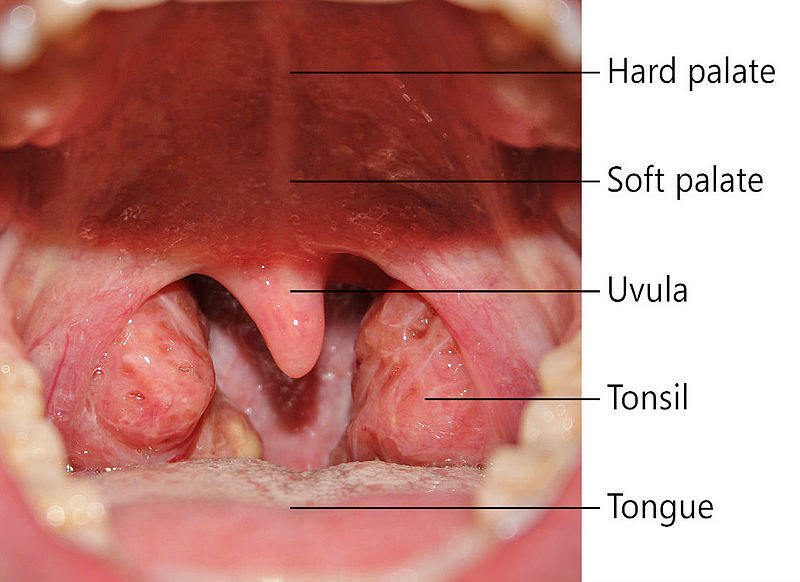 Your uvula may be unusually long or your hard palate may be low and thick. Obese people tend to have less free space in the throat, and drinking alcohol allows your muscles to relax more deeply. Also, if your nose is blocked by allergies, polyps, a deviated septum or other abnormalities, you are likely to snore. If you have children, you may have noticed they snore when they have a heavy cold. Firstly, because your partner needs their sleep. Lack of sleep results in crotchety, bad-tempered people who find concentrating on their work and enjoying their home life difficult. Secondly, snoring may be a sign you are suffering from sleep apnea. This is a serious condition which requires treatment. It is important to have an idea as to why YOU snore. It is essential you eliminate sleep apnea before experimenting with different aids on your own. Your first step should be to consult with your physician. Your doctor can suggest a cause and initiate treatment. He may refer you to a sleep specialist, and you may need to spend a night sleeping in the clinic, so the staff can find out exactly how you sleep, and whether you have sleep apnea. Once you have your diagnosis from your doctor, it’s a case of finding the best sleeping aid to prevent you from snoring. Your partner is likely to have tried earplugs, earphones, white noise, and music. Next will be leaving the marital bed for part of the night – then the whole night. According to statistics, snoring is the third most common cause of divorce after infidelity and financial problems. Sleeping on your back predisposes you to snore, as tissues fall to the back of your throat. You could stick a tennis ball to the back of your pajamas – or for a more restful solution a long pillow or rolled up towel, strategically placed, may be the answer. Some people have found that raising the head of the bed by about four inches is helpful. Losing weight if you are obese will help and also refraining from alcohol near bedtime. You can buy nasal strips. They may work as a temporary treatment for mild to moderate snoring problems. Play a woodwind instrument. Inconclusive evidence suggests that playing a wind instrument may help strengthen your throat muscles and reduce snoring. Nasal congestion has several causes. When people suffer from allergies, hay fever, and sinusitis, the nasal airway becomes narrow, and breathing through the nose creates vibrations in the airflow, resulting in snoring. Nasal strips consist of thin, plastic splints fixed across the bridge of the nose by an adhesive bandage, just behind the nostrils. They are inexpensive, have immediate effect and may be a good first aid until other methods have been explored. A small study was done to try to evaluate the effects of external nasal strips and sleep position on snoring and quality of sleep. The results showed that sleeping on the side instead of the back helped, and using nasal strips made sleep less disrupted. It is important to realize nasal strips are not sufficient for treating sleep apnea. The only effective treatment for such conditions as polyps, nasal septal deviation, and huge adenoids which block the nose, is surgery. This usually gives excellent results. The idea behind these anti-snoring pillows is to support the head in a position which keeps the jaw open and maintains an open airway, and yet be comfortable enough for the person to get to sleep. The pillow should give good support for the neck and spine and prevent the chin dipping down onto the neck, which closes off the airway. The advantages are that you do not need pills or potions, you not need to put something in your mouth or to wear a mask. They should be comfortable and non-invasive. However, the Nitetronic anti-snoring pillow has a different rolling effect. With multiple inner chambers, instead of tilting your head it rotates your head while you sleep. Try this: make a snoring sound while looking straight ahead – now try to make the same sound while looking to the side. What do your notice? Isn’t it harder to snore effectively on the side? When you turn your head to the side, the gap between your tongue and throat gets wider, so the vibration ceases, and all is quiet. The Nitetronic goodnite™ Anti-Snore Pillow claims to reduce snoring by up to 85%. And if you want a pillow with lots of gadgets, you could try the Zeeq Smart Pillow. This plays music, has a snore alarm and feels very comfortable. Reviews suggest it may be slightly less effective than the goodnite™ pillow. Which mouth piece to choose? There is a bewildering choice of mouth devices on the market. Finding the right one for you is tricky – but can be well worth the effort. The market realizes this so manufacturers often provide a money back guarantee. So, for a limited time, you can test the device out to see if it is your perfect fit. If you lie on your back, there is good chance your tongue is the culprit – it drops to the back of your mouth and blocks your airway. A TRD is designed to keep your tongue forward, and it doesn’t go inside your mouth at all. You do need to be able to breathe through your nose for this device. However, you can use this even if you have loose teeth, dentures or talk in your sleep. A small suction cap attaches it to the tongue, and the tags on the device fit snugly between your inner cheek and gums. It is held quite securely. For the right person, these are effective, comfortable and non-invasive. These work by keeping your lower jaw from falling back. This makes it harder for your tongue to relapse and block your airway. The mouthpieces need to fit to be comfortable, and there are several different ways the manufacturers have found to do this. You can find a comparative review of mouthpieces here. The mouth piece comes with a tray with the impression material in. You simply have to boil it to soften the material, bite hard on it and then cool it down, with the help of ice. You will need to note whether you should push your jaw out to make the impression or use a normal jaw position, and then adjust the mouthpiece later. Some companies will send you a dental impression kit. 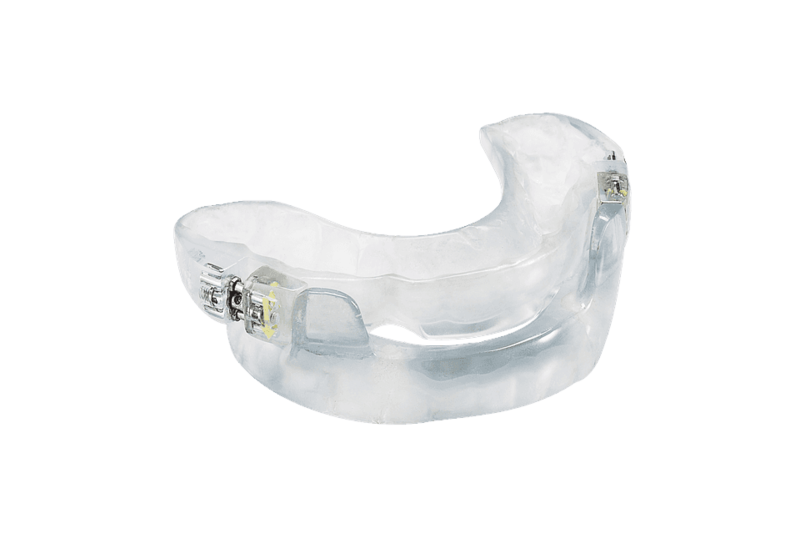 Your make your impression, return it, and they make your custom mouthpiece. Although you have to wait for it, the fit is usually very good. A few products, like ZQuiet, come ready made – but you may need to trim them with a file. Another way to get the perfect fit is to make adjustments to the device. The SnoreRX allows you to make adjustments up to 6 mm. You may find cleaning these a little more difficult due to the additional nooks and cranies. Your mouthpiece is going to spend almost a third of your life inside your mouth! So, you need to take care in choosing one that is safe, effective and comfortable. Some people need extra air holes. If you are a mouth breather, you need airflow holes. Remember the larger the holes, the bulkier the device. This is important! Not all devices are the same. It must be completely smooth. Even a small irregularity, constantly rubbing in the same place, can make you feel very sore. As for chemicals., some of the cheaper versions use cheaper material. Make sure your device is constructed from a medical grade thermoplastic material. It is not uncommon (around three million Americans) for people who are exposed to latex repeatedly to develop an allergy to it. Be very sure you do not have a latex allergy if your device contains latex. Both the tongue retaining device(TRD) and the mandibular advancement device (MAD) take some getting used to. You are likely to have a sore tongue or jaw for a few days. But it should not be painful. You may find you are drooling a lot – this does improve. As long as the United States Food and Drug Administration has cleared the device, you can be sure it is safe. You still need to be aware of the materials it is made from, especially if you do not purchase the product directly from the manufacturer. Check that your teeth are firm, and check whether your device has been passed for use with dentures if that applies to you. For most denture wearers, MADs are probably not the first option. And what about bridge work, crowns or caps? This is one of the advantages of the TRD, in that they can be worn with weak or compromised teeth. As you can imagine, your mouthpiece gets dirty and needs cleaning after every meal to eliminate get rid of food particles and to prevent the build-up of bacteria. Manufacturers may sell their own brand of effervescent tablets, for a weekly soak, other may simply advise a toothbrush and paste just as in cleaning your teeth. Whatever method you use, it is vital that you clean your device regularly. Many people who snore also grind their teeth. An MAD can treat both conditions, although the device may not last as long! Normally, they last between 6 months to 18 months, but there is a great variation. If you have a temporomandibular joint disorder (TMJ), where your jaw is misshapen, perhaps through arthritis, injury, a misaligned bite or dislocation, you should not insert a mouthpiece as they can make the condition worse. Young children often snore. The size of their airway is smaller than that of an adult and tonsils and adenoids are comparatively large. They are also prone to repeat upper respiratory tract infections. Placing objects in a growing child’s mouth is damaging and may lead to distortion on the jaw as normal growth is hindered. Most children grow out of their “snoring phase,” but there is still a minority who need the “Ts & As” operation to remove their tonsils and adenoids. These children commonly breath through their mouths which, always seem to be open, and they have a nasal quality to their voice. They may also have associated hearing problems which affect their speech and general development – so children need to be assessed by a pediatrician. Costs vary from $30 to $200 or more. The most expensive is not necessarily the best option for you in terms of fit and comfort. Sleep apnea goes as stage further than simple snoring. The breathing actually stops and restarts with a gasp. This can happen many times during the night, a frequency of five times per hour is not unusual. Each episode can last for several minutes. The result is a sleep-deprived person, and the long term results can be catastrophic. However, treatment is very effective and can completely change the quality of life for that person – as well as their partner. The first line treatment for both snoring and sleep apnea rely mainly on lifestyle changes, losing weight if you are obese, giving up smoking and late-night alcohol, and getting enough sleep! Sometimes an MAD may help. Sometimes surgery is indicated. The value of a good night’s sleep cannot be over-estimated. There are a lot of new innovative snoring aids every year. If you snore, first eliminate sleep apnea as a cause by consulting your doctor. Then, take the time to find the best anti-snoring device for you. Your partner will be delighted and for you, the value of a good night’s sleep may, perhaps, be measured in the value of your waking hours, in increased energy. Snore Devices – 2018 Black Friday / Cyber Monday Deals!